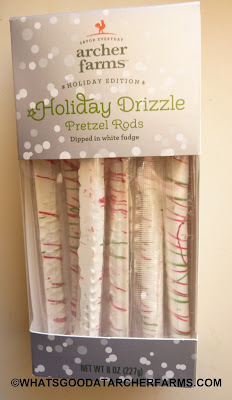 For a minute, I thought these pretzel rods were covered in a type of peppermint bark. Much to my delight, they're not. 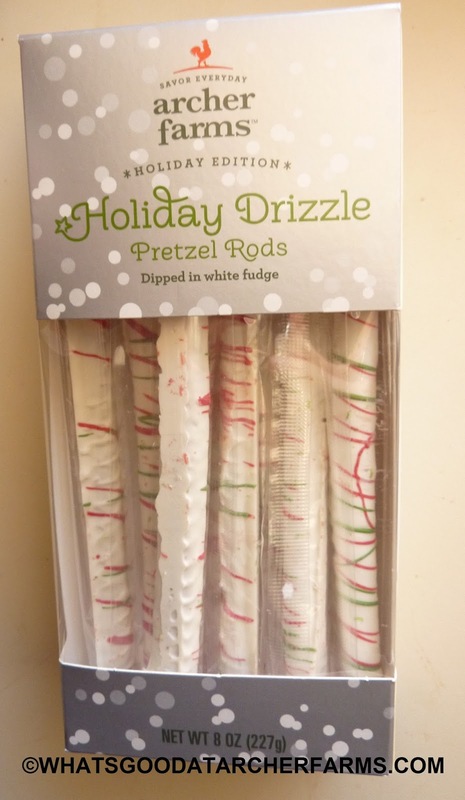 Not that I have anything against peppermint bark or peppermint bark-covered pretzels, but sometimes I just want a snack that doesn't remind me of that "just-brushed-clean-feeling." I've always been a fan of white chocolate/white fudge and chocolate-covered pretzels. The salt from the pretzels sets off the milky sweetness of the white chocolate very nicely. These pretzel sticks are no different. They taste and feel exactly like white chocolate-covered pretzels should. They're individually wrapped, so they stay nice and fresh even after opening the box. They'd make perfect stocking stuffers or favors for co-workers and that sort of thing. The red and green icing adds a nice festive touch. $5.29 for eight sticks seems a little steep to me. But I guess you're paying for all the packaging and pretty snowflake design on the box, etc. Plus, I can't complain about the size of each pretzel rod. It was just about perfect to curb the munchies without making me feel like I had overindulged. If you're interested in the nutrition information, please click here. I'm'onna give these pretzel sticks 8 out of 10 stars.